Who doesn’t want to say YES to new adventures? Admit it. Most of us (myself included) got a lot of places all over the world in the “bucket list” that we want to make memories with and even invest ourselves in a meticulous planning for the travel. But you know what? There are instances wherein you never prepare yourself for a particular journey, yet it turns out to be one of the best that you’ve ever experienced. Truly. Entertaining the idea of unplanned adventure especially when you’re alone (haha. Regardless if you agree with me or not…). It becomes a lot less complicated, short durations but not short excitement (more surprising instead); travel light, opens you to new friends and acquaintances, less expensive than the planned ones, far more memorable and brings you a deeper perspective in life. 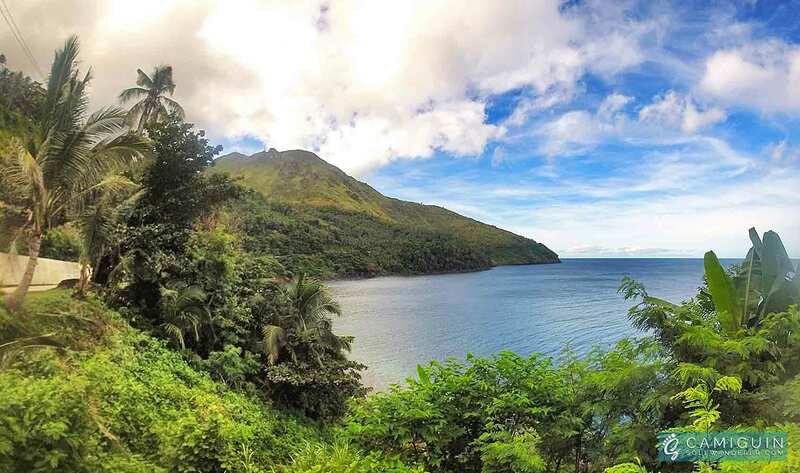 So let me take you to my own “pack your things and go” journey to Camiguin Island Philippines, the place which attracts a lot of itinerants too. I’ve witnessed the reasons why is that so. 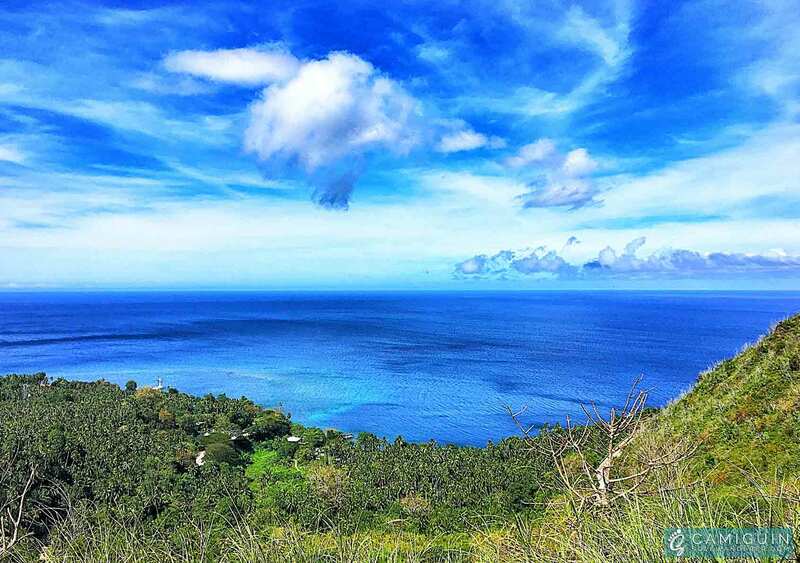 First, it is the smallest province in Mindanao and second to the smallest in the entire Philippines (after Batanes) which is located in the Bohol Sea, about 10 kilometers off the northern coast of Mindanao. 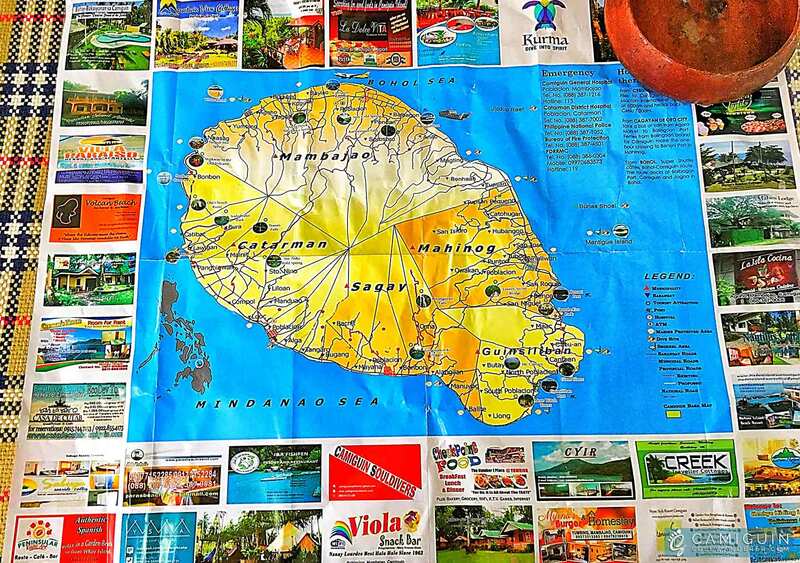 It is also said to be the country’s most peaceful island-paradise created by volcanic eruptions and land movements, thus dubbed as the “Island Born of Fire”. Camiguin is a tiny island of lush forests, volcanic splendor, eternal springs hot and cold, and pristine patches of black and white beaches, majestic waterfalls, year-round festivals, exotic marine life, a glorious past, serene surroundings, idyllic lifestyle and jovial people (Indeed an ideal destination for a weekend getaway!). I mean, who wouldn’t fall in love with nature? The island harbors seven volcanoes which names are: Mt. Hibok Hibok, Mt. Mambajao, Mt.Guinsiliban, Mt.Timpong, Mt.Vulcan, Mt.Uhay, and Mt.Tres Marias. Amazing, isn’t it? Depending on your preference. Yes! Lucky that there are two options available: plane and ferry. If you wish to ride by ferry, there’s a trip every Friday at 8:00 PM (fixed schedule), a Super Shuttle travels from Pier 8 Cebu to Camiguin. It is quite slow to which travel time may take 12 to 15 hours (depends on the weather condition) to reach the island. Make sure to plan something to kill your boredom during the trip. The fare is affordable in which a one-way ticket costs PHP 800 to PHP 1,000. Note: You can buy a ticket at any Super Shuttle outlets in malls or designated pier. 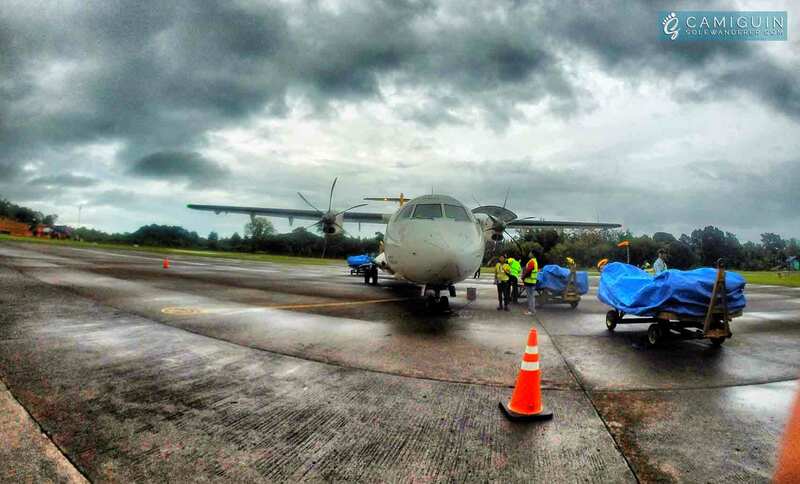 If you prefer to save time, the fastest and probably the most convenient way to Camiguin is a plane trip. 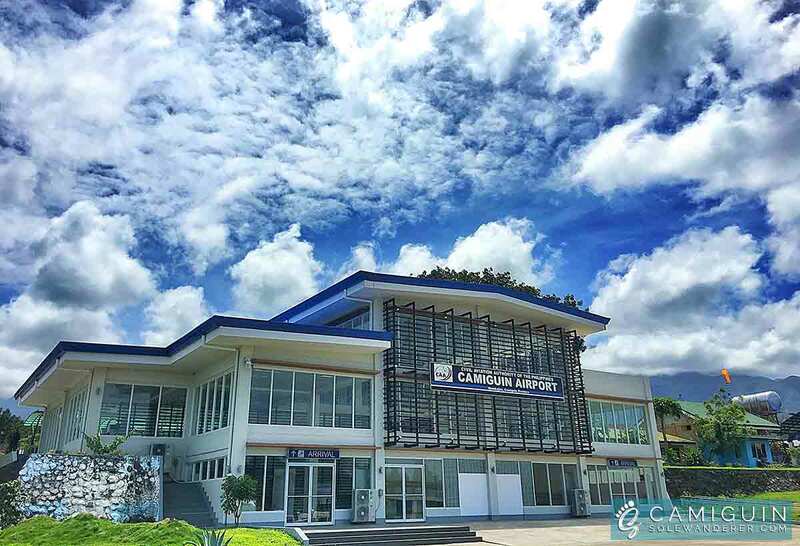 Cebu Pacific Air Daily and Philippine Airlines Daily offer direct flights from Mactan International Airport (Mactan, Cebu) to Camiguin Airport (Mambajao, Camiguin). A one-way ticket ranges from PHP 1,400 to PHP 3,000 depending on the season and time of booking. (I also suggest you download a few apps in your mobile for discounts & points like traveloka, travelbook.ph, agoda, etc.) You may visit their official website Cebu Pacific Air and Philippine Airlines for schedule and bookings. There are various decent homestays, hotels, lodges, cottages, etc for you to choose from. I would recommend staying in Yumbing, Mambajao, the heart of Tourism in Camiguin which is just 10 minutes away from the airport. 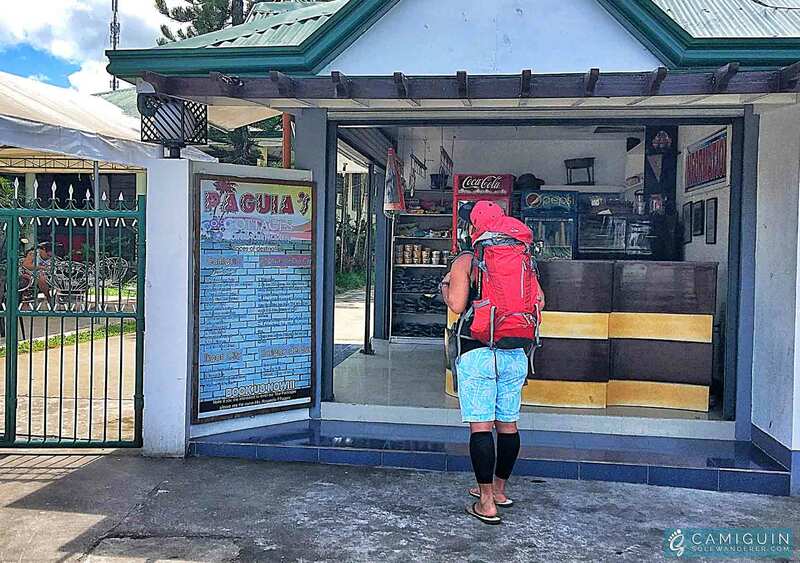 There are numerous cheap cottages that can be found in Yumbing (that is if you’re a “budgetarian” traveler), in my case, I suggest Paguia’s Cottages which is located just opposite the famous White Island. 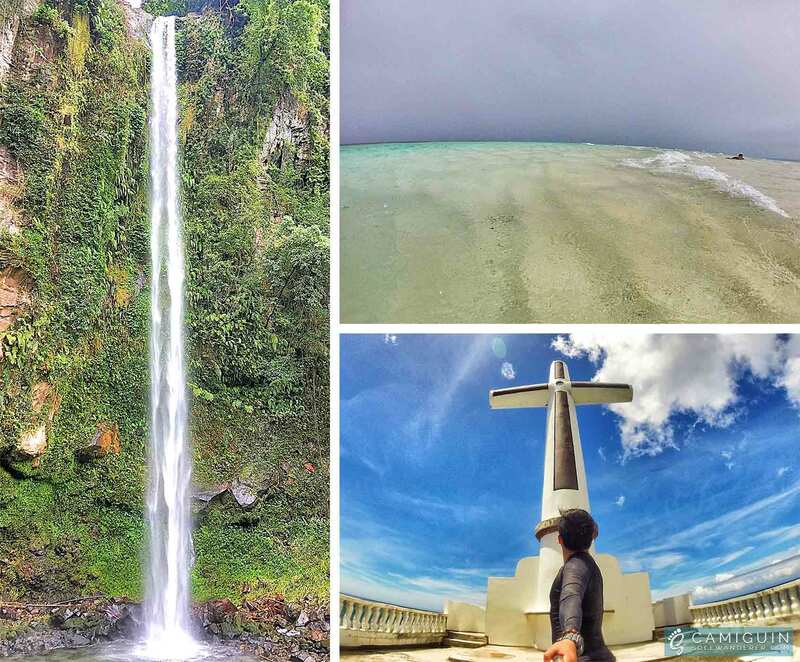 Here’s a glimpse of Camiguin – literally a small island. With a motorbike and at 40 kph to 60 kph speed nonstop, you can roam the countryside of this pear-shaped island in an hour approximate. Where am I headed – is something we ask as first-timers and that’s okay. It’s not something to fear about, dude. Every adventure requires the first step. It’s all up to you. My first story right after I landed Camiguin started in the so-called White Island. This first destination becomes a sizzling day for me. Aside from the island’s balmy breezes, you gotta be ready with a sunblock lotion with the highest SPF (I suggest the max beach sunblock with 100++ SPF) as the island has no shades to hide unless you are willing to spend another Php50 for an umbrella. Overall, this is a superb place to unwind and get your skin tanned while watching the birds catch small fishes for food. It’s not best for snorkeling as there were not many marine species in the coastline. But, what enjoyed me most and will push you to try is their fresh sea urchins that are sold by the locals on the island. There’s always a hidden message in every waterfall as they say. 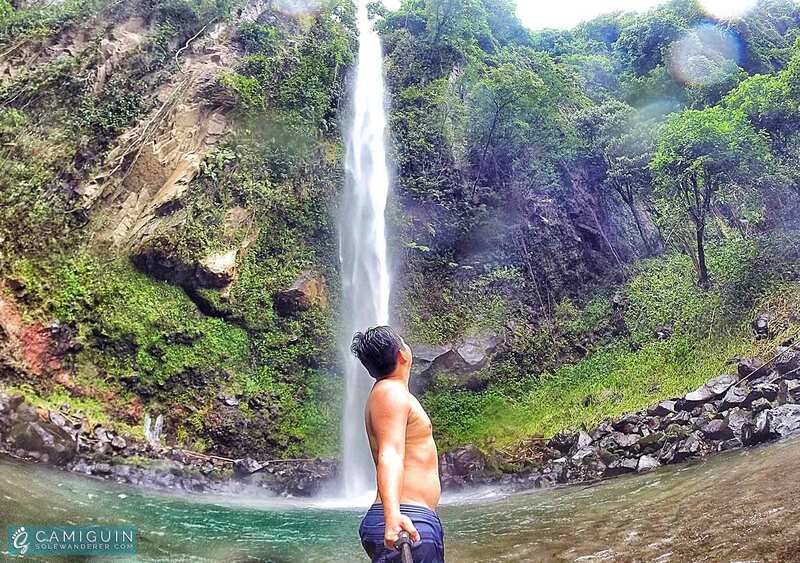 And I couldn’t help but share my experience Chasing Waterfalls in this island such as Katibawasan Falls in Mambajao, Tuasan Falls in Catarman and Binangawan Falls in Sagay. Indeed, if you truly love nature, you will find beauty everywhere. 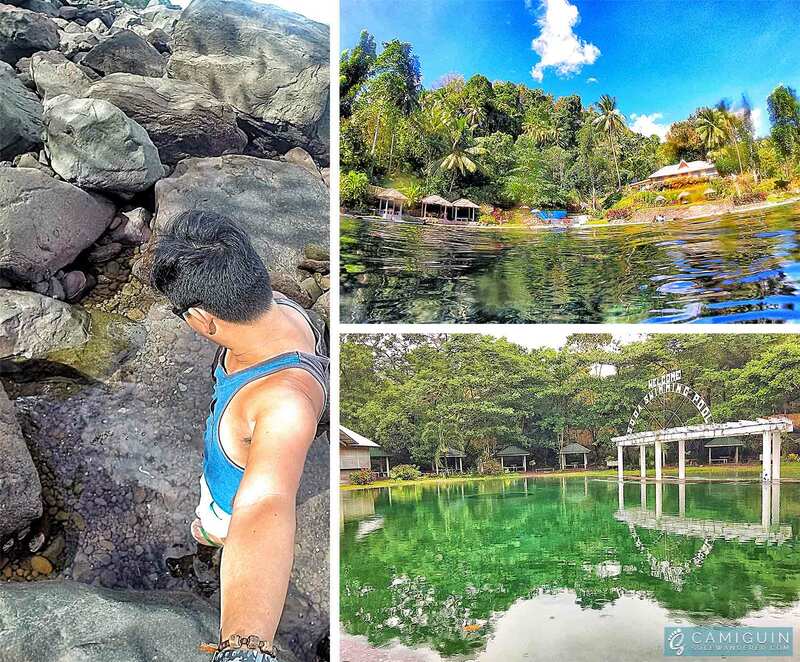 You’ll enjoy their hot springs like Ardent Hibok-Hibok Hot Spring and Tangub Hot Spring. 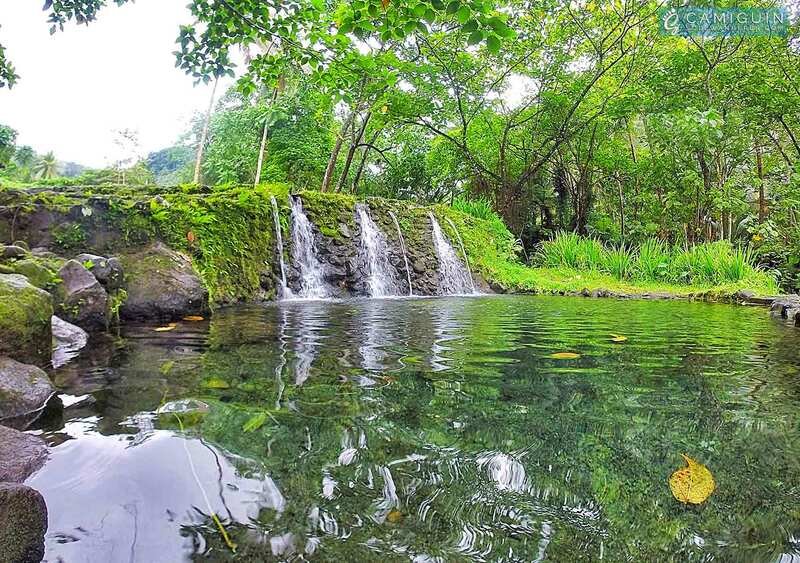 Also, take a dip on their freezing cold springs like Saay Cold Spring in Mambajao and Sto Nino Cold Spring in Catarman. Their springs were like saying “Let’s party!” in its natural way. Lol. And if you wish to swim your heart out, then get horrified and swim over the giant cross lying underwater and gravestones underneath the seabed of Sunken Cemetery. In the 18th Century, a volcano near the cemetery erupted causes the cemetery along with the surrounding place of the capital city to sink below sea level. Relaxation affirmation. Check! The Guiob Church Ruins looks like a historical site from tremors and eruption but the walls and columns look really sturdy which remained standing after the catastrophe (time to take another photo shoot for a perfect spot). I pause for a moment to savor this tranquil and refreshing place in a sizzling day of Camiguin. Lots of shade from the towering trees stood the area. A place your soul can just “be”. Nature truly inspires. You don’t need to spend hours here, half an hour will suffice though it’s definitely worth to stay. 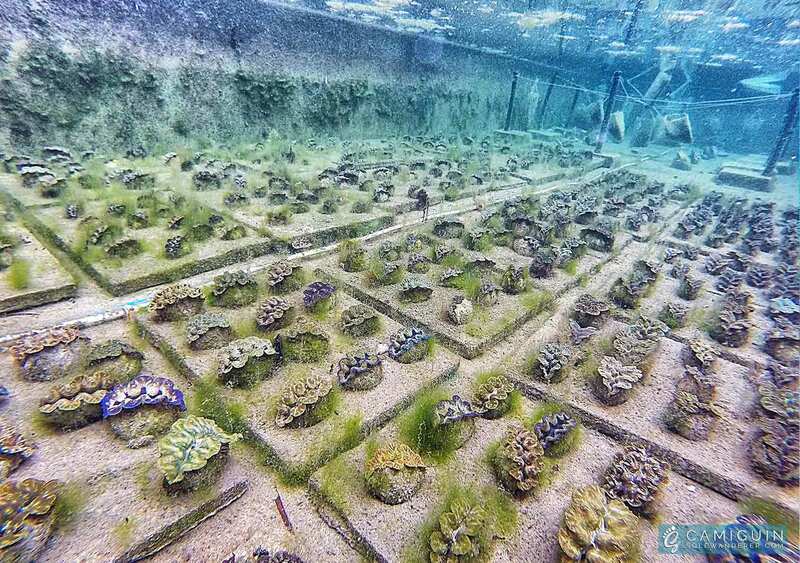 The Giant Clam Sanctuary is quite fascinating and well worth the stop off. Not being much environmentally aware of the life of clams, this is a timely experience to discover its life cycle with an affordable entrance fee. The place may not be too winning for other people’s taste, but I believe the locals allocate most of their tourism revenues in the conservation of clams. However, expect to loosen the purse strings if you wish to go out and dive on their reef. I found myself recognizing the full worth of the children in this community. The light-hearted gestures of the little girl at the entrance who ran through all the prices and rules we need to take into account. The buoyant 4 kids at the pool area where they raised the clams are too eloquent and well-rehearsed, we never had a problem understanding them. We shouldn’t underestimate the power of wisdom from these individuals. 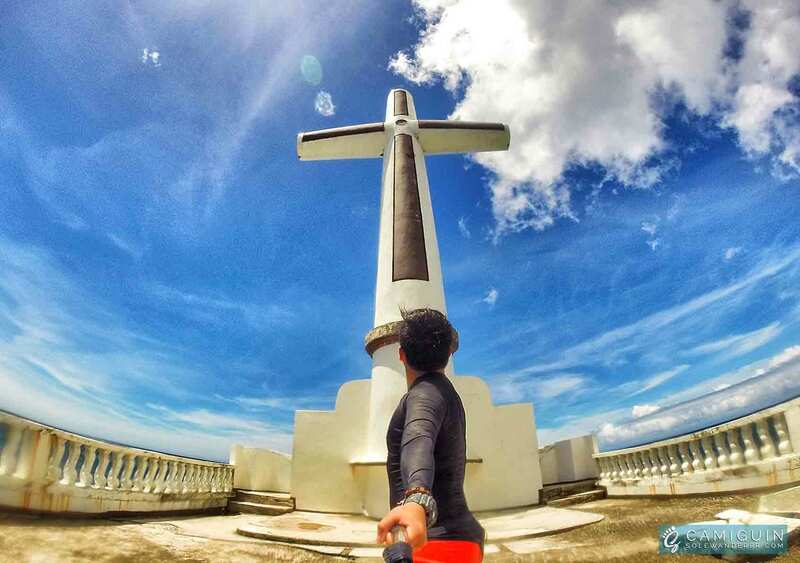 During Lenten Season, Walkway To The Old Volcano And Stations Of The Cross is a famous pilgrimage site for Roman Catholic devotees with an 8-km path to reach the old volcano’s summit and 14 human-sized stations of the cross. It was a long trek for me which would take at least 30 minutes to reach the last station. Well, the trek duration really depends on your walking pace and how much you take a pause to capture photos of nature and selfies. The walkway and Stations of the Cross are laid out in a stairway ascending all the way up to the top where the old volcano is. The locals connoted the walkway as hundred steps of the history of the crucifixion of Jesus Christ. After the first two stations, the climb is a bit more difficult because it’s steep though the stairway is shaded by huge towering trees. I just climbed up to the 10th station though, enjoyed a look at the stunning view of the sea from the top and decided to went down. This activity is recommended for fit people only as it requires more of your muscles with great exertion for a strenuous walk, a bit risky to senior citizens. is such a beautiful place to do aqua sports and I’m pretty confident you’ll feel stranded on the island. 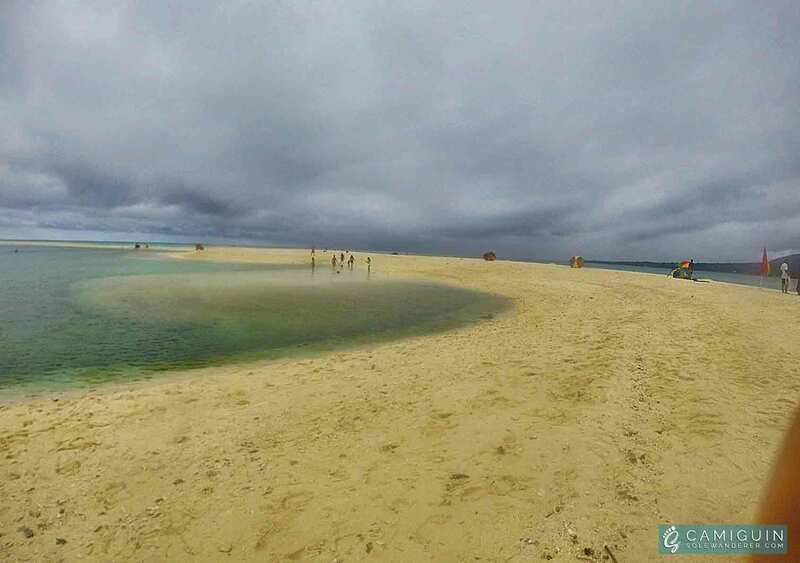 Taguines Lagoon, located in the town of Mahinog, just a few minutes away from the Benoni Port of Camiguin, is an artificial inland lagoon. This man-made lagoon was created primarily for fish breeding purposes, which explains why the local Bureau of Fisheries office is also located there. 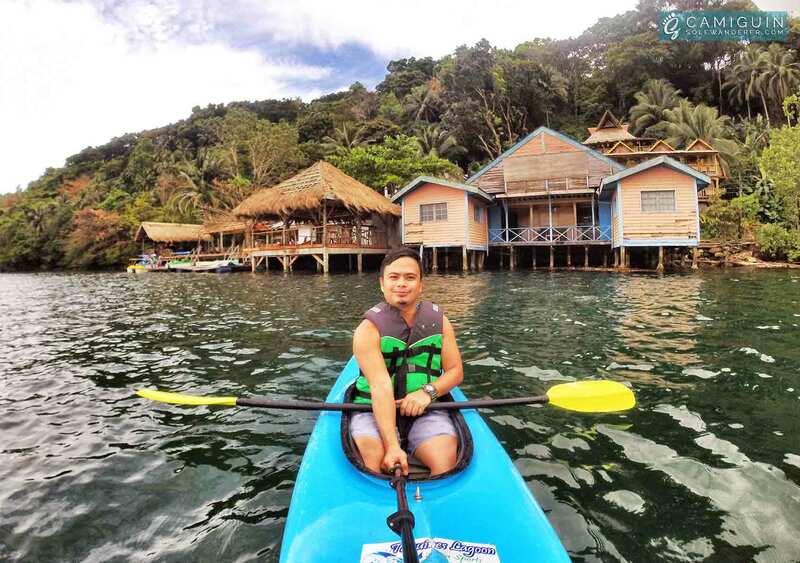 Perhaps to make the most of the lagoon, various activities for locals, tourists, and water sports enthusiasts were offered such as kayak, pedal and paddle boats., mostly courtesy of the Taguines Lagoon Aquasports and Recreational Facility. You can try out the zip line in the area if interested and would need you to coordinate with the staff at J&A Fishpen Restaurant. You can book any activities you’d want to do anyway. There’s always a first time for everything indeed because this is the place where I took my first Kayak experience. Although you got instructions from a staff member, the first time you do a thing is always exciting. 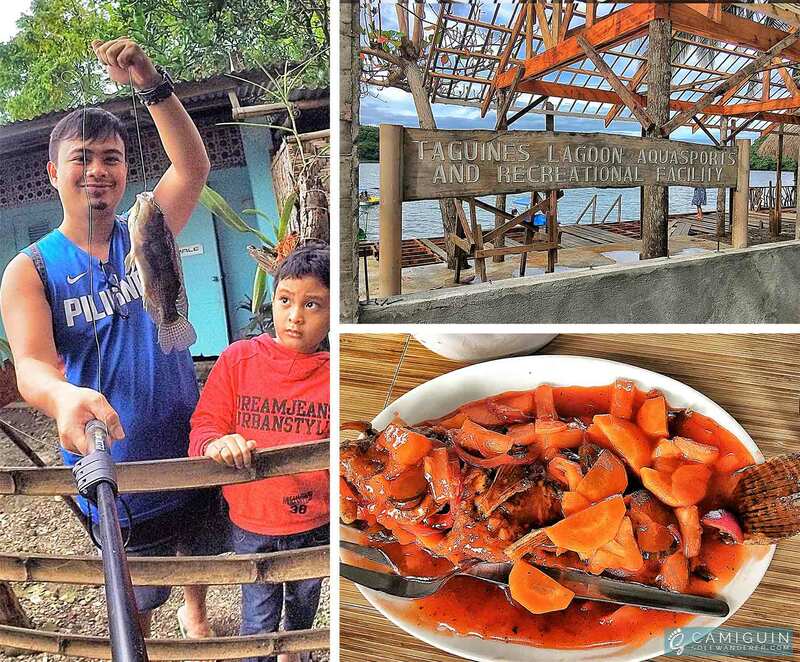 Lagoon Bistro (Taguines Lagoon) is one of the popular place located in the same island Mahinog. I would certainly rate this place as 4 stars because of its relaxed ambiance, overlooks the calm lagoon, mountains, and the Mantigue Island, plus with great food of fresh seafood (which is my favorite) and their great service. What more could one ask for? You can even catch your own snapper from the holding pens if you order it from their menu. Happy tummy, satisfied customer. The best part of traveling is to follow your heart that will lead you to.. food. Yes.. if you “Eat well + Laugh often + Love much = Less Stress“. If you’re on a budget, there are few food stalls in the area selling local foods like adobo, fried chicken, “atsara” and even boiled eggs, sweet potato, and banana. If you prefer Italian foods, there are a few food shops where you can have pasta and pizza like Checkpoint and Alex Resto Bar. There are music sessions in Alex Resto Bar if you wish to go night out for a drink and chill. 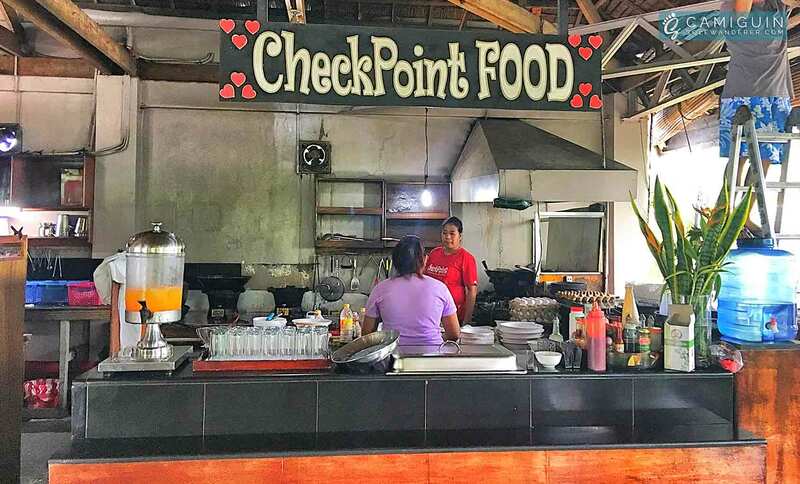 Also, Checkpoint has a daily Breakfast Buffet for PHP 160. Dishes like Tuna Tinola, Fried Dishes (Eggs, Hotdogs, Bacon, Corned Beef), together with toasted bread, salad, cold and hot drinks etc. Rico’s Lechon, on the other hand, offers barbecues, “lechon manok” and “liempo” if you prefer to go on heavy meals. Pinoy dishes are great! I believe that people who love to eat, are always the best people. Now I’m getting biased here. Lol. How to travel like a pro? 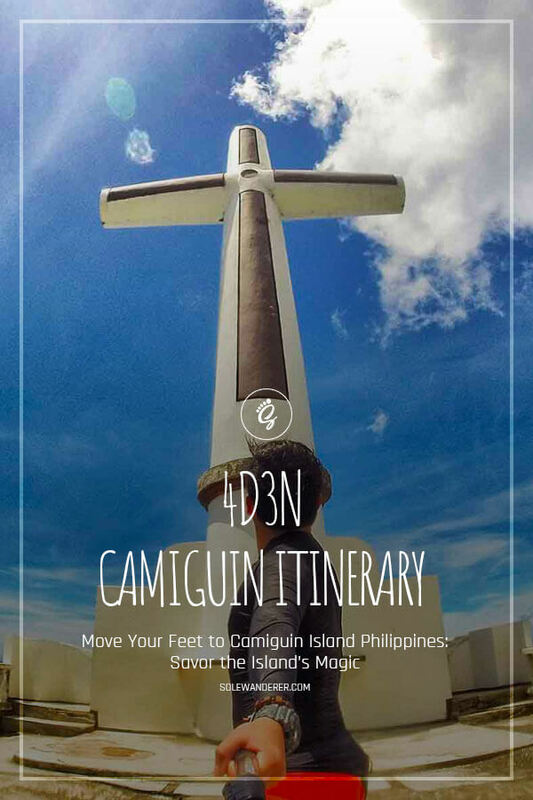 Let me give you a few tricks that can help on your trip to Camiguin. Accommodations are cheap on this island. But if you are traveling alone, you can still negotiate and pay a lot cheaper. For instance, a PHP 600 room for 2 can be negotiated down to P500. Might as well practice your negotiation skills though. With regards to transportation, tricycle at the airport will cost you PHP 150 – PHP 200 drop-off to your hotel. Just ride one outside of the airport for as low as PHP 20. When you start to wander in the island, there’s a motorbike for rent that normally offers PHP 500 for 24 hrs especially at the airport. Don’t get fooled, most resorts offer PHP 300 to PHP 350 also for 24 hrs. Note: Ordinances in Camiguin are strictly implemented. Thus, wear helmets at all time if you travel with a motorcycle. There are few attractions where greatly seen in a specific time. Like the Sunken Cemetery, go snorkeling while the sun is up so you could clearly see the seabed. 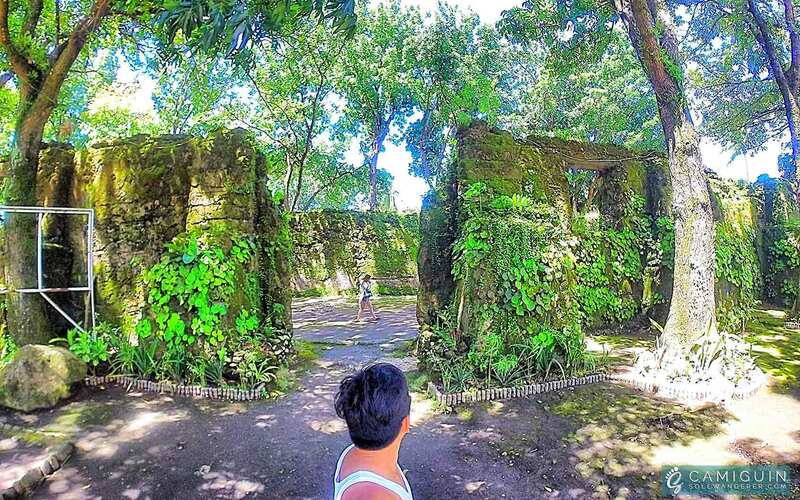 Most of the attractions have an entrance of P30 per head and cottages from PHP 40 to PHP 75. 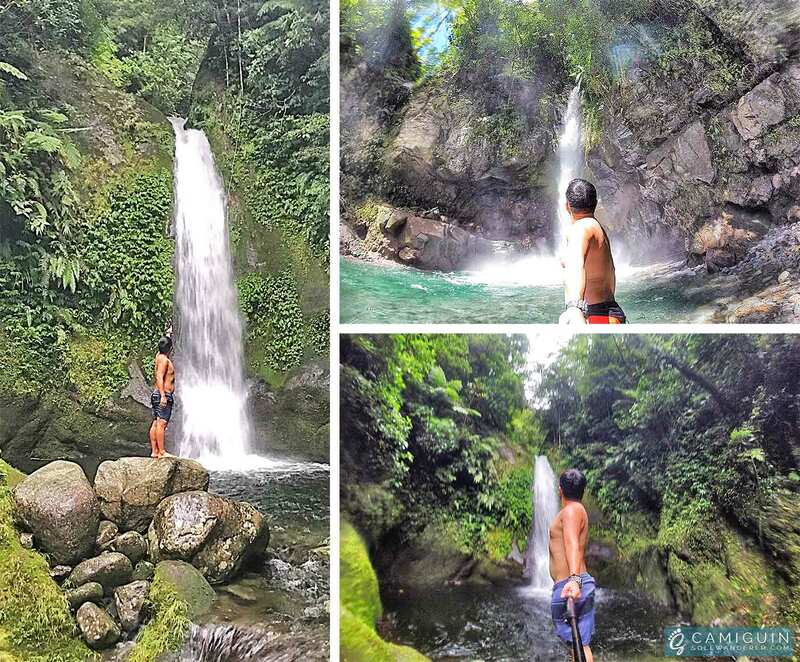 If you wish to go to Binangawan Falls, prepare yourself to walk through a cliff full of bushes. And be there before late afternoon, as the place has no electricity and completely secluded. Prioritize the distant attractions first and put least the nearest ones on your location. Again, if you’re budget conscious, you have an option not to hire a tour guide or agency because I’m pretty sure you can do the tour by yourself. Last to mention but just as important, bring food container if you wish to take out food from restaurants. … So that’s how my 4 Days and 3 Nights Camiguin Itinerary looked like. 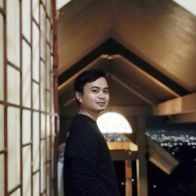 I was flexible with my itinerary and didn’t veer as much because I travel alone. Just make sure to get enough rest while enjoying the stay in the island.